Keeping your pool cover clean of water during the off-season can be a struggle, but for many, it’s a necessary part of pool maintenance if you want to protect your cover and prevent your pool from overflowing. In this article, we’ll be looking at the best pool cover pumps, including the various types available for both above ground and inground pools, comparing them side-by-side to see which one is right for you. The following pool cover pumps have been chosen for comparison since they’re regarded as the most popular options among pool owners today. Note — If you’re just here to get a breakdown of your options, you can click this box to jump straight to the product review section. When Should You Buy A Pool Cover Pump? There are a number of reasons to get yourself a pool cover pump, and if you’re reading this buyer’s guide, you’re no doubt aware of at least some them. Opening your pool: Not only does using a pool cover pump mean less mess to clean up at opening time, but it also means not having to worry about dirty water falling into the pool when removing the cover itself. Closing your pool: Most people don’t consider the fact that a pool cover pump can be useful in closing your pool, particularly because you can use it to lower the water level for proper winterization. Protect your cover: Debris, snow and frozen water can damage your cover, and any water build up could attract birds. You’d be surprised how quickly a bird beak can pierce your cover, and that’s without even mentioning a very literal sh*tstorm. Protect your pool: Without a pool cover pump working it’s magic, your pool is likely to overfill which puts stress on the walls. If you value your investment, this is something you’ll definitely want to avoid. When Shouldn’t You Buy A Pool Cover Pump? Not every purchase makes sense for every person in every situation, which is why I’m also going to list off reasons why you might decide AGAINST getting one. Open All Year: If your pool is open all year round, then you If you don’t have much use for a pool cover, which means you certainly won’t need a pool cover pump. Tight Budget: Pool cover pumps aren’t the cheapest piece of pool equipment you can buy, and potentially not the highest priority either. If you’re stuck for cash, you can probably postpone this purchase. 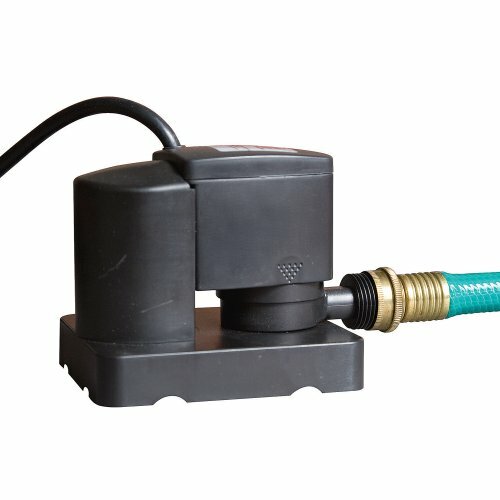 What Types Of Pool Cover Pumps Can You Buy? When looking at the different types of pool cover pumps available, it can sometime be hard to know exactly what to go for. As with most things, there’s really no one-size-fits-all solution. It’s simply a case of understanding your options so you can make a more informed buying decision. The two types of pool cover pumps you can buy are typically manual or automatic, and as you can imagine, there’s a big difference between the two. Both of these work in the same way fundamentally, in that they remove the buildup of water and snow on your cover (with the help of a standard garden hose), preventing damage to both the cover and the pool. The good news is, an automatic pumps offers a much more elegant solution. Instead of relying on user input to know when to start pumping, automatic pumps are able to detect water buildup and get to work on their own accord. That means you can just rest the pump on your cover and it will handle the rest all by itself. No need for you to step outside for days or even weeks at a time. It’s also worth noting that automatic pool cover pumps are safer because they stop pumping when the water has been drained, whereas a manual pump will continue and potentially damage the cover. How’s that for a strong argument? How Do You Choose The Best Pool Cover Pump? Knowing which type to look for will narrow your options down to some degree, but it still doesn’t tell you what the right product is. If you really wanna drill down your options, you have the look at the factors behind what makes a great pool cover pump, well… great. Type — Is It Manual Or Automatic? This time, however, I can confidently recommend an automatic pool cover pump over a manual one in 98% of cases. The only time I wouldn’t? If you’re REALLY stuck for cash and you have a small pool that doesn’t require too much maintenance. That’s it. 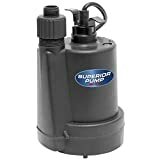 But even then, I’d still advise you to push for an automatic pump if you can afford the difference, though I will include a review for what I believe to be the best manual pool cover pump out there at the moment. Flow Rate — How Much Water Can It Move? Pool cover pumps are rated by their maximum flow rate — also referred to as gallons per hour (GPH) — and it’s important to get something that can really get the water moving when you need it most. There’s no “perfect” number here but if you have a large pool and ultimately a large pool cover, you’ll want to get something on the higher end. If you have a smaller pool, you could get by with a weaker pump which will almost always be noticeably cheaper. Of course, this is just a guideline so don’t refer back to it religiously, but it’s good to have a ballpark estimate of what you need. Durability — How Long Will This Thing Last? When you invest in something like this for your pool setup, the last thing you want is to have to go through the whole process again in a couple of years time. As with most pool-related purchases (or any purchase for that matter), there are few key things that will guarantee you end up with a high-quality, long-lasting pool cover pump. 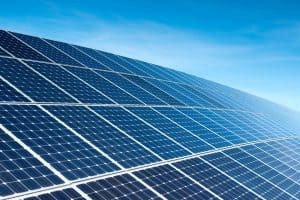 The first is going for a reputable brand. In the pool cover pump market, the top dawgs are Wayne, Little Giant and Superior. If you go for an unknown brand it can be a little more risky. Second, and perhaps most importantly with this particular piece of equipment, is not holding back on the pennies. These machines are typically not the cheapest anyway, but spending more will make a HUGE difference in terms of overall quality. Any Other Factors You Should Consider? The points above are, in my opinion, the most important things to consider when it comes to buying a pool cover pump — and these will make up the bulk of my product ratings below. But they’re not necessarily the only things. Activation level: Automatic pool pumps will only turn on once the water buildup reaches a certain depth (measured in millimeters) in order to protect the plastic cover. These depths can vary from pump to pump. Fully Submersible: Not all pumps are able to operate while fully submersed under water, which is an important attribute under serious conditions where this is likely to be required. 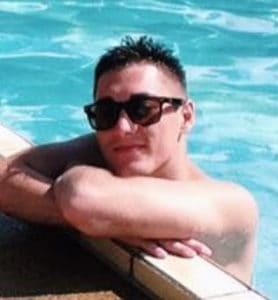 Cord Length: Something most people wouldn’t give a second thought, but it’s crucial to ensure your pumps cable will be able to reach your power socket from your pool area. Freeze Protection: While no pump will be able to run through freezing conditions without breaking, some will be intelligent enough to *not* turn on when temperatures plummet. This is a real money saver if you happen to forget to unplug on a particularly cold night. Debris Strainer: Pretty self-explanatory but equally important. This is used to prevent leaves and other debris from getting inside and messing with your pump. Now that we’ve covered what to look for in a pool cover pump, you’ll be able to use the comparisons below to make a more informed decision about which makes sense for you and your needs. The following products were hand-picked for review, where they have been evaluated and rated based on the same criteria I outlined above. 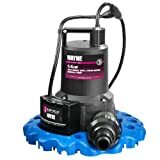 The WAPC250 automatic pool cover pump from Wayne comes in at 1/4 horsepower, with a maximum flow rate of 3,000 and is one of, if not the most popular pump of it’s kind. 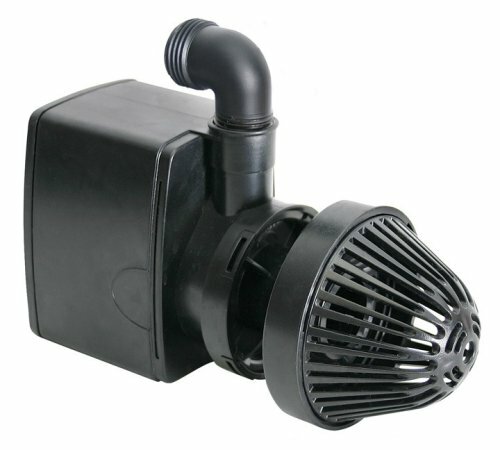 There’s a number of positive points to mention about this pump, with the first being that it packs a punch in terms of horsepower, making it ideal for those with medium to large pools. The build quality of this thing is also commendable, ensuring it’ll keep up the pace well beyond it’s 3 season warranty — a good thing too, because it’s certainly not one the cheaper pumps on the market. Perhaps the only real negative aside from the price is the fact that the activation depth is 2 inches, with some users finding this results in too much water buildup prior to the pump turning on. Overall though, you’ll be hard pushed to find another pool cover pump that ticks as many boxes as this. 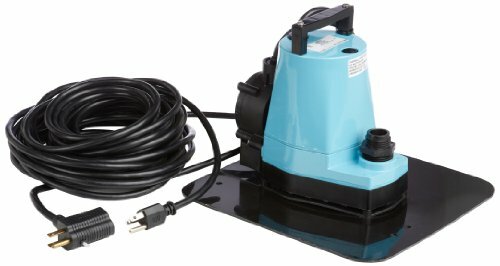 The Dredger Jr automatic pool cover pump from Blue Wave has a maximum flow rate of 350 GPH and is guaranteed with a one year warranty in case of failure. Despite what many would consider a weak pump in terms of it’s maximum flow rate, this can and is still used by folks with small to medium size pool covers, as well as in ground pool covers. There is, however, a worrying number of reports of premature failure with this machine, and with only a 1 year warranty to back it up, you may find yourself having to buy another sooner than you hoped. This 5-APCP automatic pool cover pump from Little Giant comes in at 1/6 horsepower, with a maximum flow rate of 1,200 gallons per hour and a reasonable 2-year warranty included. 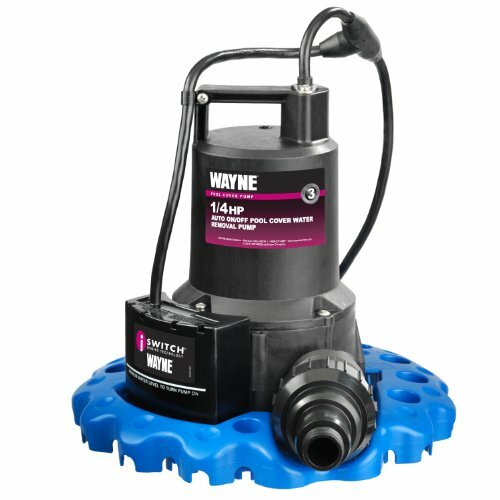 Like the Wayne model (#1 in this list), the 5-APCP is a very popular alternative that can move a good amount of water when needed, but also performs particularly (and surprisingly) well in freezing conditions. The strange thing about this pump, however, is that some users report early failure (less than a year), and others report no issues even after 5+ years. As long as you exercise proper care, you should be fine. The 91250 automatic pool cover pump from Superior is available in three different models of varying horsepower (from ⅓ to ⅕), allowing for a maximum flow rate of between 840 and 1,680 gallons per hour. Perhaps the biggest selling point of this pump is the price tag, and it’s hard to argue with what you’re getting here for the money — regardless of which model variant you go for. This thing is able to really move water without kicking up a fuss, and is relatively quiet at the same time. The only negative I can point out is that it only comes with 1-year warranty. The 14942702 manual pool cover pump from Little Giant has a maximum flow rate of 550 gallons per hour and a respectable 2-year warranty. Unlike the other pumps in this buyer’s guide, this is the only one that will not automatically turn off when water is not present, or below the activation depth. It’s also cheaper than most automatic models, so that’s the trade off. It does, however, have a very low maximum flow rate and will not be ideal for moving large amounts of water — which makes it a bad choice when dealing with larger pool covers. Protecting your pool—and your cover—throughout the cold winter months can be challenging, and the only way to ensure a smooth opening is to be prepared for the worst possible scenario. For many pool owners, a decent pool cover pump is an essential piece of equipment that offers the best protection in the worst conditions, as well as extending the life of your pool. 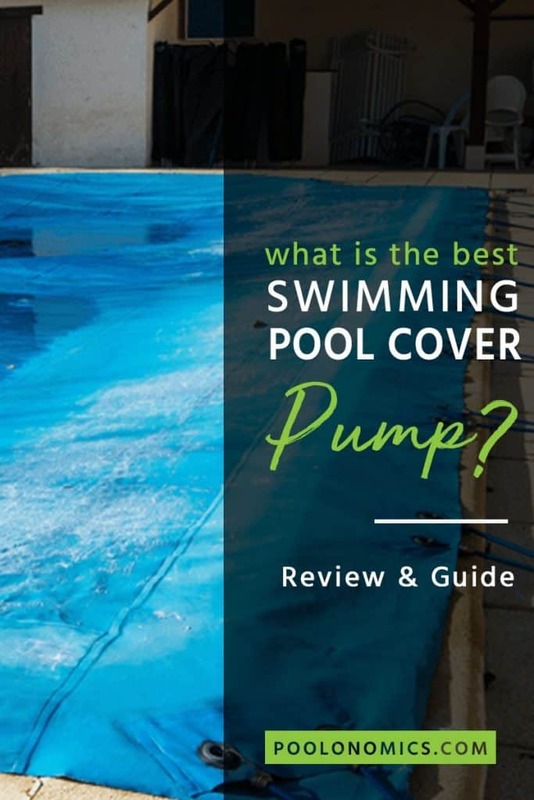 The good news is, if you follow this pool cover pump buyer’s guide (and check the reviews) from start to finish, you’re already in a much better buying position than most. Good luck and happy pumping!